Millions of people in the United States suffer from tooth loss due to tooth decay, tooth injury or gum problems. In the past, the only options available to treat missing teeth were bridges and dentures. Fixed dental bridges worked as a viable option to replace one or two teeth. This method involved grinding down the neighboring natural teeth to connect them to the replacement tooth. Although this step in the bridge-making procedure functioned well, patients’ complaints included their teeth being prone to decay, plaque accumulation, bacterial infections and periodontal disease. For larger toothless areas, when all the teeth from top and bottom were lost, the only option available in the past was a full set of dentures. While conventional dentures supported facial muscles and restored the smile, they came with several disadvantages including slipping and sliding, gum irritation, chewing issues, debilitated talking ability and more. Looking To learn more about Dental Implants treatment in New Hyde Park, Long Island (NY), our dental experts at NIDA can answer all of your questions. Our New Hyde Park office is easily accessible from the surrounding towns on Long Island, and we are leading providers of Dental Implants treatment in Long Island NY. If you want to learn more about Dental Implants Long Island, our dental experts at North Island Dental Arts will assess missing tooth or teeth, and answer all questions you have about the various types of implant procedures. Several implants placed strategically to get dentures on the upper arch, lower arch, or both. Single stage dental implants are an advanced dental implant procedure that allow our dentists and dental implants NY periodontist, to place the implants in one visit. With one stage dental implant surgery, the patient doesn’t need to undergo a secondary surgical procedure. In certain scenarios, the artificial teeth can be fixed to the implant in the same sitting. Why Choose Dental Implants Treatment? 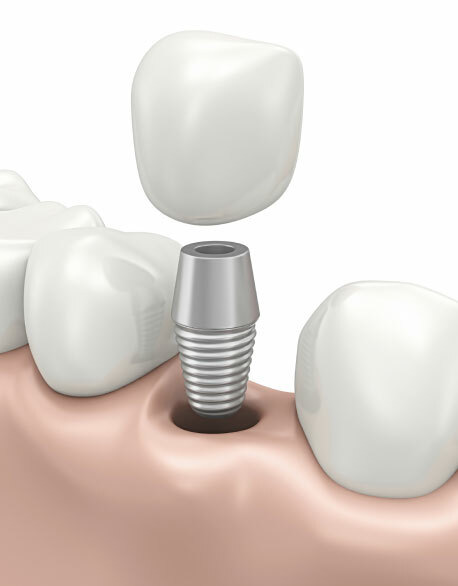 Implants are effective because they use a titanium post to mimic tooth roots, as a sturdy base for a restorative crown. The titanium implant fuses to the bone during osseointegration. It creates a strong and durable base, which means implants will not slip or move around. Dental implants are long-term solutions that blend in with natural teeth and restore function back into your bite. Patients are able to speak and eat without limitations and maintain their quality of life. The materials used are built to last. Dental Implants are the most advanced technology available to replace missing teeth. They help maintain the natural shape of your face. Missing teeth can promote premature aging. A single prosthesis (crown) is used to replace one missing tooth. Usually, each prosthetic tooth gets attached to its own implant. To replace two or more teeth, a partial prosthesis (fixed bridge) is used. If you are looking for a single tooth prosthesis or other types of Dental Implant Treatments in New Hyde Park, Long Island NY is a great place to be, as that is where our office is conveniently located. To replace all the teeth in your upper or lower jaw, a complete dental prosthesis (fixed or removable bridge) serves the purpose. A fixed prosthesis is screwed down and is permanently fixed with the implant. This is only removable by the dentist whereas a removable complete prostheses (overdenture) is attached to a bar or ball/socket attachment. The variation in the number of implants is dependent upon the type of prostheses recommended. With freestanding dental implant supported bridges, the fixed restorations are placed in areas not bounded by natural teeth, which had removable partial dentures before the “osseointegration”. An overdenture is a full or partial denture that is altered to attach to dental implants. Patients with sufficient bone density can get overdentures with two or more implants placed on the dentures. After the implants heal, the dentures are clipped to the implants. With overdentures, the dentures do not put any pressure on gums; instead, the implants take the pressure off the dentures, omitting the need to use adhesives. Fixed implant bridges are best suited for people with several missing teeth. When replacing overdentures, normally around six or more implants are placed in the upper and the lower jaw. Each implant works as an anchor for a dental bridge. A crown is placed over each dental implant and fabricated tooth or a pontic is connected in between the crowns. Overdentures and fixed implant bridges require regular dental checkups to measure the density of the jaw and ensure dental implants stay strong. Fixed detachable prostheses allow for easier hygiene underneath them, but cannot be removed by the patient as the teeth are held by screws placed into the implants. Only the dentists can remove them and this is done periodically for cleanings. The dentist along with an in-office periodontist can perform advance dental implant surgery at North Island Dental Arts in New Hyde Park, Long Island NY. It is conveniently located a short drive from North Shore/Long Island Jewish Hospital. Doctors and multiple dentists are also available during extended hours on Saturdays. There are variances in the types of dental implant treatments New Hyde Park patients should be using, so you should schedule a consultation with our dentists at our office and we will go over all of your options with you. When you visit for the first time, our expert dentist performs a 10-point smile analysis to identify your particular problems and put together the best treatment plan possible. We use DentalVibe to reduce the sting of injections and give our patients a more comfortable experience. Dental implant treatment requires a highly skilled team to provide patients with optimum results. Our team of expert doctors is trained in the complexities of bones, muscles, and nerves. Surgeons, periodontists and dental specialists at Dental Arts work together in the same center to provide all-inclusive and best in class dental treatment. With an accurate imaging facility, in-house dental lab facilities and expert consultants – all together in the same center – we offer the best possible experience to our patients. Q: How many options are there to choose from if I am looking for dental implant treatments in New Hyde Park on Long Island? There are many different ways to go about replacing a missing tooth or missing teeth. One of the most effective ways is by using dental implant, but there are also other options for treatment that are best discussed in person after your consultation. When you come to our office, our team of expert dentists will examine you to determine what type of procedure you are the best fit for. Q: Am I a candidate for dental implant treatment if I am missing more than one tooth? Yes, there are several dental implant treatments New Hyde Park based patients can opt for. Including for single and multiple teeth replacement. A partial prosthesis is used when the patient needs multiple teeth replaced. The best way to find out what procedure would be best for you is to contact our office today. We are happy to speak with you about all of our Dental Implant Treatments in Long Island. Q: Are dental implant treatments painful? Absolutely not, our team of dental experts makes sure that any discomfort you incur during the procedure is as minimal as possible. We prepare the area using the proper anesthetics to numb the area. When the titanium post is placed for the implant, you won’t feel pain. The abutment will not cause pain either. 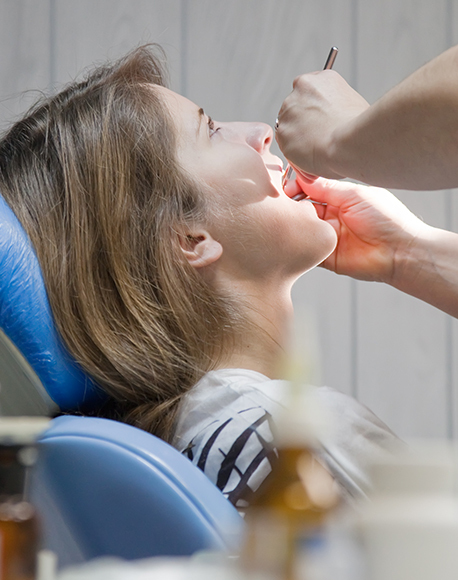 It does not matter whether you are replacing a single tooth, or multiple teeth, the procedure is not a painful one. Contact us today to book your appointment; we look forward to helping you restore your smile with our advanced dental implant treatments in New Hyde Park at our state of the art office. Q: How many visits to the office does it take to get dental implant treatment? Most of the time there will need to be an initial consultation to assess your mouth and what type of implant strategy will be used, depending on if we are replacing one tooth or multiple teeth. This is why if you think you need some type of dental implant treatments New Hyde Park is one of the best places you could be. Our office is right on Hillside ave, so schedule your consult today. After the consultation phase, we will schedule another appointment for the surgery to add the titanium post to your mouth that the implant will be attached to. In some cases, the entire dental implant treatment can be done in one visit. This is called a single stage dental implant and it may be right for you; contact us to schedule your consultation and find out what type of dental implant treatment is right for you! Q: Is dental implant treatment a permanent fix? Dental implants are made to last. When it comes to Dental Implant Treatments New Hyde Park dental experts at North Island Dental are the best choice for your smile. Implants are built using the latest materials, and the titanium rods that we use to keep the implant in place are incredibly sturdy. Once the implant is set, the patient will not be able to remove the tooth from their mouth. Occasionally your dentist might want to remove the implant to enable a deeper cleaning, but dental implants are typically used as a permanent solution to single or multiple missing teeth. At North Island Dental Arts, we make sure to give our patients the best possible solution for their missing teeth. The dental implant treatments New Hyde Park has access to are state of the art thanks to North Island Dental, schedule your consultation today. We guarantee you will be satisfied with our work. Contact North Island Dental Arts Today! Dental implants are a viable and effective solution for most patients with missing teeth. During the initial examination, we will determine if you have enough natural bone material left to support the artificial tooth root. In some cases, implants might not be the right answer, but fortunately there are effective alternatives. No matter what your dental health situation might be, we will find the right set of treatments to correct and restore your smile. Contact our office in New Hyde Park today for more information or to schedule an appointment.